Feed-a-Gene and SAPHIR, both EU H2020 research programmes, will hold a joint stakeholder session during the next EAAP annual meeting in Dubrovnik, Croatia. Animated by Jaap van Milgen and Marie-Hélène Pinard-van der Laan, this session will present some promising results for the future of animal productions. Don't miss this stakeholder meeting on 30th August 2018! A new series of interviews was filmed during Feed-a-Gene's third annual meeting in Newcastle upon Tyne (UK) in April 2018. In this first episode, Sandrine Espagnol (France) presents the approach of the project's sixth Work Package and her work as an environmental engineer. The 3rd Feed-a-Gene Newsletter is available! The 3rd Feed-a-Gene newsletter is available! It presents the current state of the project and provides progress reports for all the work packages. 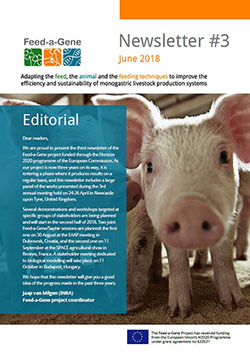 Read more about The 3rd Feed-a-Gene Newsletter is available! The third annual meeting of the Feed-a-Gene project took place on 24-26 April 2018 in Newcastle upon Tyne, United Kingdom.